Open to ABA member stores. Need not attend Winter Institute to enter or win. The upcoming 2015 Winter Institute in Asheville isn’t just any old ABA gathering. 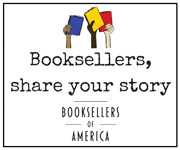 Come next February, for the tenth time, ABA will present the most anticipated annual event in bookselling, offering learning, networking, authors, a new city and stores to explore, and, perhaps most importantly, a place to connect with friends and colleagues. And that deserves something special to remember it by. Send us an original Wi10 themed design—be sure to follow the do’s and don'ts here—by September 5, 2014. Four finalists will be chosen by ABA, and one design will be chosen by the membership to win the Grand Prize of $150. The winner will be announced on or around October 1, 2014. Winter Institute volunteers and select guests will receive a commemorative t-shirt with the winning design for the event, and a limited quantity will be sold there. All design files will be uploaded to Redbubble in time for everyone to order his or her own shirt—or whatever!—before arriving in Asheville. *T-shirts for certain; no guarantees about other merchandise, but we’ll try to make that happen.